Ch: Hanshan Shide. Semi-legendary Tang dynasty, Zen 禅 (Ch: Chan) eccentrics who were frequently depicted in Chinese and Japanese ink painting. Kanzan 寒山 (Ch: Hanshan; lit. cold mountain) is thought to have lived as a poet-recluse near Mt. Tiantai (Jp:Tendai 天台) in Zhejiang 浙江. Jittoku 拾得 (Ch: Shide; lit. foundling) was so named because he was found by the Zen master *Bukan 豊干 (Ch: Fenggan) and raised in the Tiantai temple Guoqingsi 国清寺, where he worked in the kitchen and gave leftover food to his friend Kanzan. The little that is known of their biographies is provided in the preface to a collection of Kanzan's poetry, Cold Mountain KANZANSHI SHISHUU 寒山子詩集 (Ch: Hanshanzishiji ; translated into English by Burton Watson) and the KEITOKU DENTOUROKU 景徳伝灯録 (Ch: Jingde Chuancenglu) compiled in 1004. Kanzan Jittoku were regarded later as incarnations of the bodhisattvas *Monju 文殊 (Sk: Manjusri and *Fugen 普賢 (Sk: Samantabhadra), respectively. They are usually depicted with ragged clothing, long, tangled hair, and grimacing or laughing wildly. 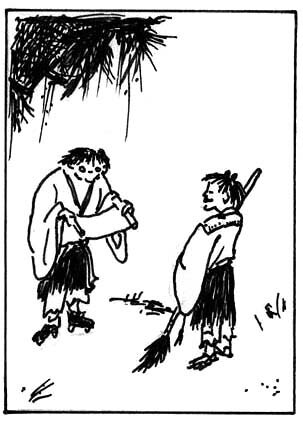 Kanzan frequently holds a scroll, presumably of his poetry although several painting inscriptions claim it is devoid of writing, while Jittoku holds a broom, indicating his position as a scullion. Along with Bukan and his pet tiger, they make up the *shisui 四睡 (four sleepers). Kanzan Jittoku form one of the most enduring subjects in Japanese ink painting. Notable Chinese examples include those by Liang Kai (Jp: Ryou Kai 梁楷; early 13c; MOA Museum), and Yintuoluo (Jp: Indara 因陀羅; late 14c; Tokyo National Museum). Well-known Japanese works include paintings by Kaou 可翁 (mid-14c; several versions including one in the Freer Gallery of Art), by Shoukei 松谿 (late 15c; Tokugawa 徳川 Art Museum), Reisai 霊彩 (mid-15c; Burke collection, New York), Kaihou Yuushou 海北友松 (1533-1615; Myoushinji 妙心寺, Kyoto), and painters of the Kanou school *Kanouha 狩野派. In the Edo period they were parodied as *mitate-e 見立絵 in *ukiyo-e 浮世絵.